That’s right….GEMS! 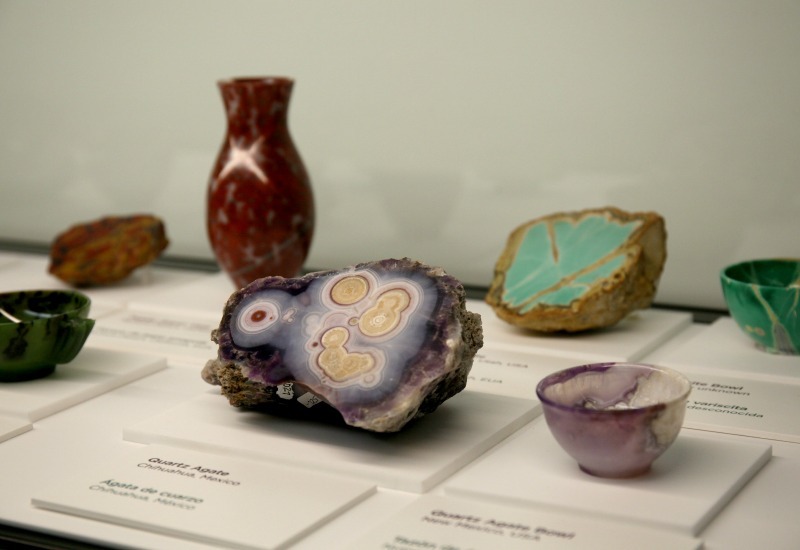 Despite the remote backcountry origin of the gemstones, their discovery in San Diego led to historic connections all over the world, from New York City and to China. In the 1800s, San Diego County became famous for the production of valuable minerals and gems from local mines, excavated from pegmatite formations in the mountains near the Pala, Julian, Mesa Grande, and Pine Valley areas. Pegmatites are rocks that are formed by the very long-term crystallization of magma sourced from deep below. They often contain very large crystals as well as minerals rarely found in other rocks. Mines are fairly common in San Diego; it is estimated that 760 abandoned mines still exist within the county. Although miners did find gold here, the quantities never amounted to that found in Northern California, so the famed California Gold Rush never really became a phenomenon in this region. However, as early as the 1890s, San Diego area mines were world famous for the production of tourmalines. Tourmaline is a gemstone that may occur in as many as 700 colors, but local mines produced stunningly beautiful crystals in shades of dark rich rose shading to paler pinks and even greens. These colored gemstones were highly prized, particularly because they were the favorite of the Empress of China at the time. Literally tons of gem-quality tourmalines were shipped to China from our little corner of the world, until 1911 when demand stopped. The tourmalines were fashioned into jewelry and carved into various objects including snuff boxes or other decorative items. The most famous local tourmaline mines included the Tourmaline Queen, Tourmaline King, Stewart Lithia, Pala Chief, and the Himalaya mine. 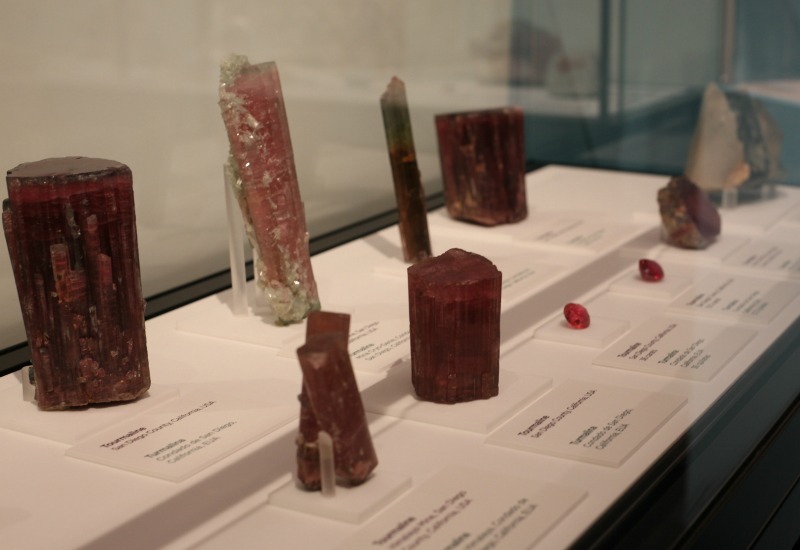 While the main quantity of tourmaline mining occurred in the past, there are currently gem-quality tourmalines still being discovered in the Pala area on a sporadic basis. Other gemstones from our county still being mined include kunzite, a striking lavender/pink variety of spodumene, which can occur in extremely large crystals, as well as morganite, topaz, and garnet. In 1903, kunzite was named after George Kunz, a buyer and officer of the famous New York jewelry store, Tiffany and Co. Kunz was lured westward and became heavily involved in the discovery and marketing of local gemstones. Kunz also discovered morganite in San Diego County, a form of lovely pink beryl named after the financier J.P. Morgan. 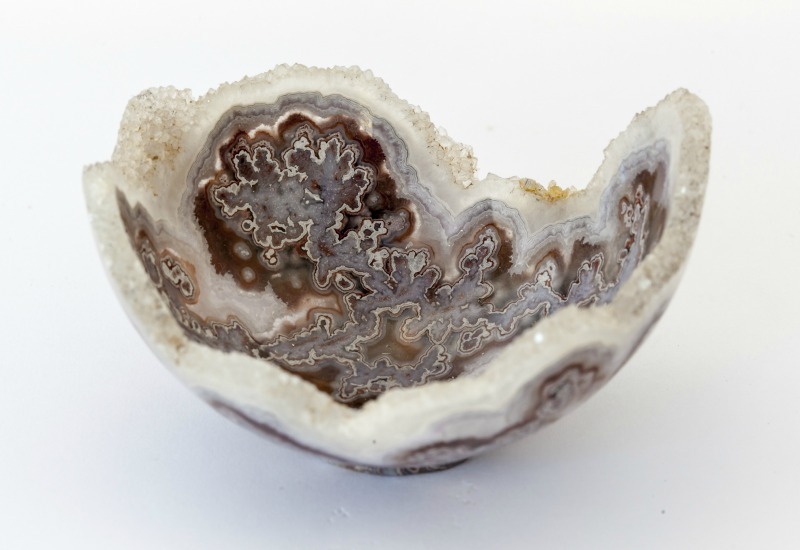 San Diego is also known for lapidary artists—someone who forms stone, minerals, or gemstones into decorative items. One such person was George A. Ashley (1904-1992), both a miner and lapidary artist who invented a special tool for cutting stones. He used it to create many valuable objects, carving delicately thin and polished bowls and vases from a wide variety of minerals. Visit Hidden Gems to see numerous Ashley creations as well as sparkling kunzite, tourmaline, topaz, and morganite specimens up close. You will come away with a new appreciation for our own San Diego as a source for bling!